The annual open house and art show at Bell’s Adult Training Facility (ATF) is a festive event. 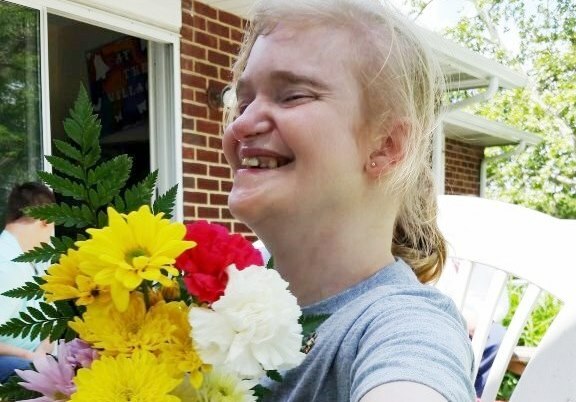 While many of the individuals who attend the program – all who live with considerable intellectual disabilities – are considered to be “non-verbal,” there’s no denying their ability to communicate joy as visitors arrive. One individual squeals with delight when someone comments positively on her artwork. Another offers a hug when they see a familiar face. Others simply choose to stand next to you and hold your hand, or watch curiously from a further distance. Another mother who came to the event, Anna Light, echoes Kathy’s sentiments. Anna’s daughter Leatha has attended the program for nearly 16 years and has become much more independent during that time. Anna is complimentary of the program coordinator and staff. “They work with us to develop specific goals for Leatha to reach, and they are really good ideas,” she said.